But this time not for me! Cobbling together a build for someone I "know". Currently she has about 775 to spend, so, this is about all I can do, but she's going to sell her laptop, which will give her more dosh. But, you know, I figure build one for what she has at the moment. So, thoughts on the build? Tried to talk her out of the disc drive by the way, I don't see much of a point anymore. They're basically obsolete for PCs now. Oh, and I opted out of the SSD and put the money into the CPU. I'm planning on sticking with this plan even if she gets the extra money, I'd like a second opinion on that as well. OS, keyboard, and mouse aren't factoring into it either. I didn't put fans in, but they're cheap anyway. DONT LET HER BUY THESE PARTS!!!!!!!! 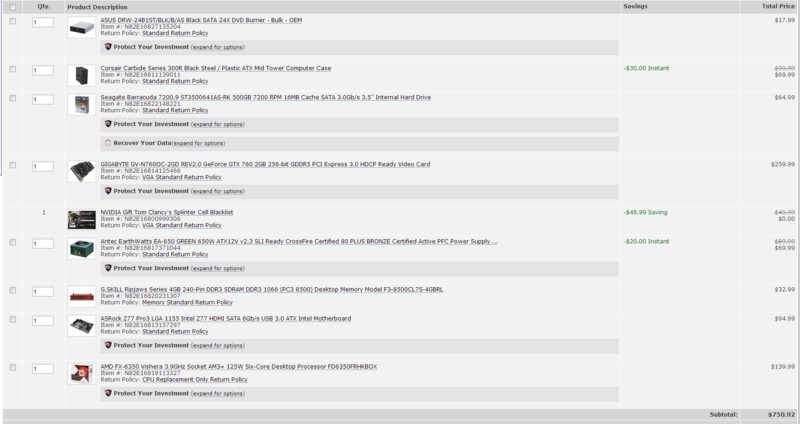 seriously though, this build is no good for $750, I'll get you a better build. Plus your processor and motherboard are not even compatible. http://pcpartpicker.com/p/1v4Ri <<<< buy these parts, they look nice, and they function better. Almost the same as my build at home. Intel beats AMD every time.